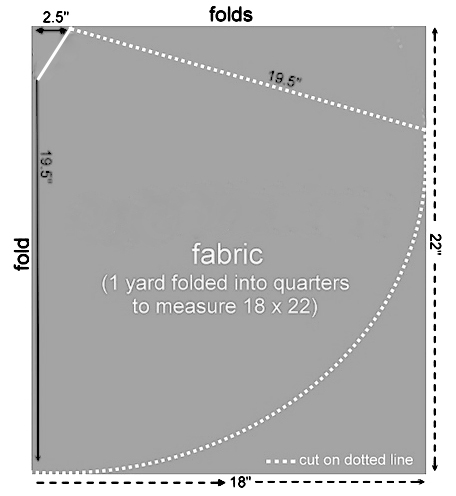 2 yards of fabric, or 1 yard of one color and another yard of another. 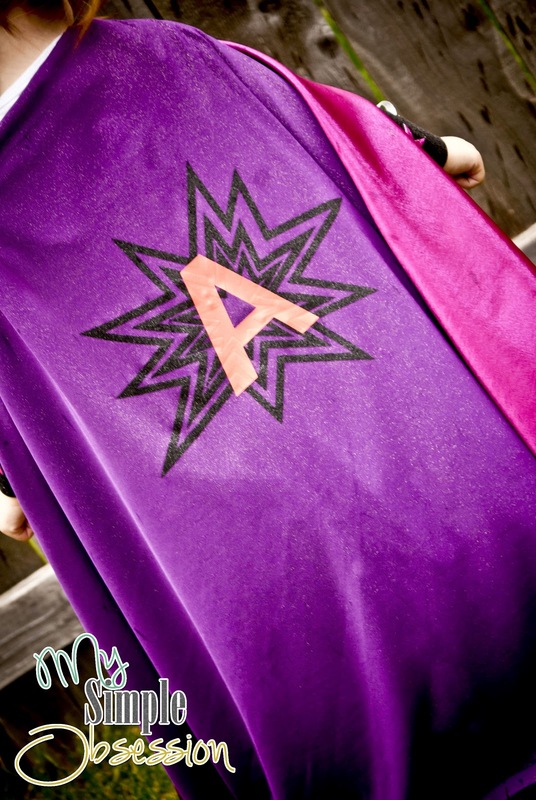 Making the Cape….. used the following picture to help me make my pattern for the cape. The top is a bit different because you want to cut straight across so you can use your heat bond room to fold the fabric over. You can sew it if you like, I just didn't want the stitching to show, so this was my solution. 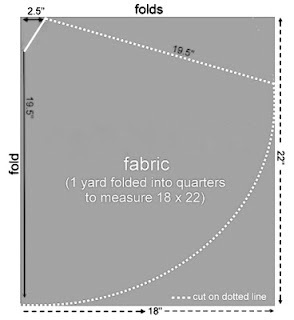 Use the pattern for both yards of fabric. Then place them so the fronts of both fabrics are facing each other and pin all sides to sew. Sew all sides except the top neck part. Once all sides are sewn, pull it inside out to make it the right side out. :) Then sew the neck line. Once all the sewing is done you can add your Heat bond to the neck line. I placed mine about 3 1/2 inches down. Fold the neck line to create a loop. Make sure there is enough of a loop for your rope. and iron down the fabric to the heat bond to create a loop. Weed the rope through the loop. Making the cuffs! Take your Black foam sheet and cut it in half along the 11in. side. Take one half and measure around your little ones arm and mark where you need to make a cut and how long you think the cuffs should be. You will use your first one and a tracing pattern for your second. 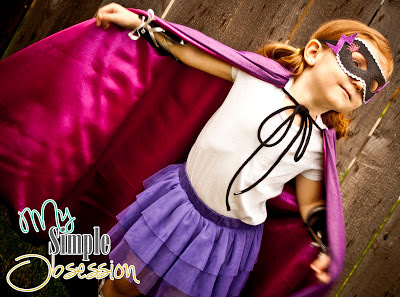 You can even use the same method of the cape and make a cone shape. Once all your cuffs are cut, punch 3 holes on each side and apply the Eyelets. I like to use my Croc-a-dile for stuff like this. 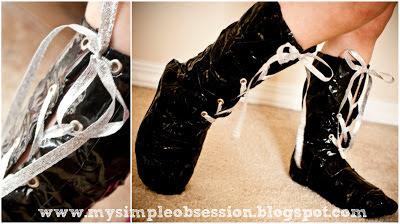 I used silver eyelets to go with all my ribbon and trims. 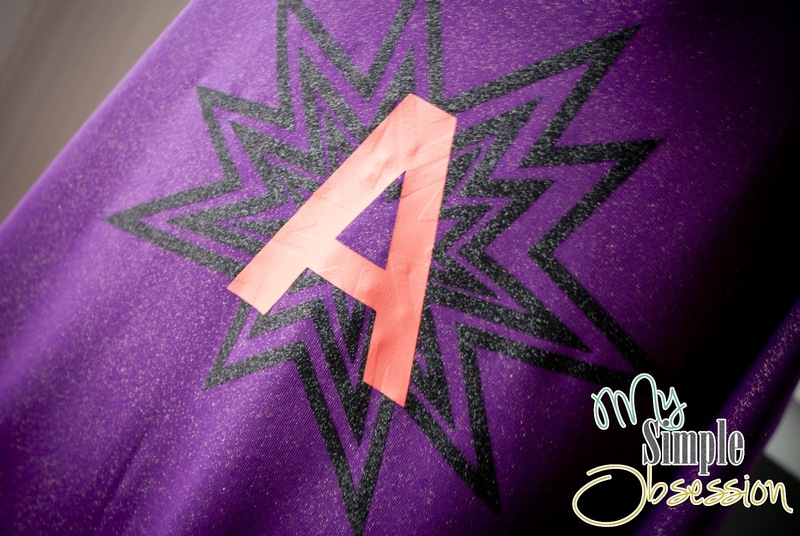 Take your pink glitter foam and trace out 2 stars. 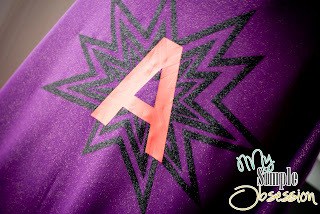 I used my cricut to create a star pattern to trace around. 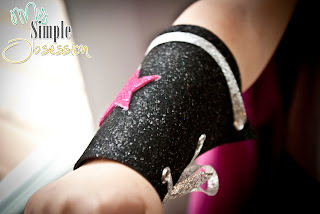 Hot glue the stars to the center of cuffs. One star for each cuff. Cut two evenly pieces of ribbon and lace each cuff. (TIP) Use a white pen to make your markings and tracings. The Mask. The Mask was pretty easy to make because we had bought one at target in the kids clothing area that was by superhero t-shirts. **If you can't find the mask at target there are plenty of patterns on the internet if you type in Super Hero Mask Pattern in your search. 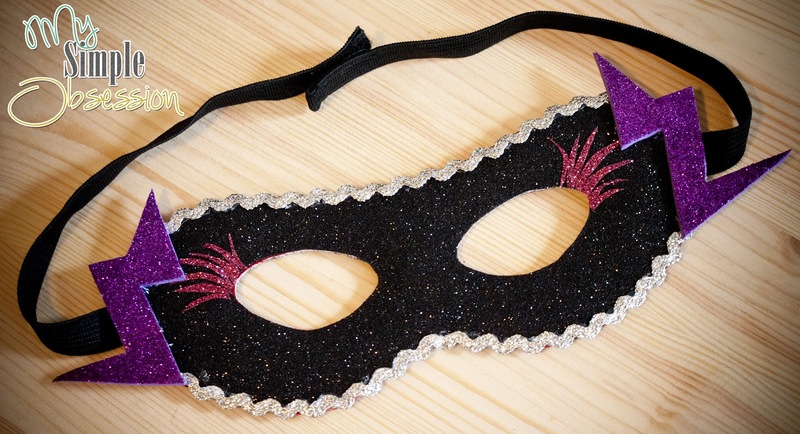 ** All I did was trace the mask on top of the glitter vinyl and cut it out. Then I iron on the vinyl on top of the mask. I cut out eyelashes in pink glitter iron on vinyl and ironed them on top of the black glitter. 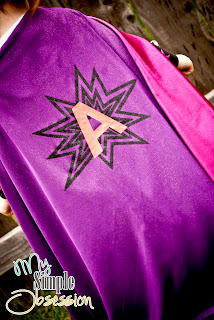 Then I took my glitter purple foam sheet and cut out a lighting bolt. And to make it opposite I traced the first one backwards to I would have a left and right side bolt. 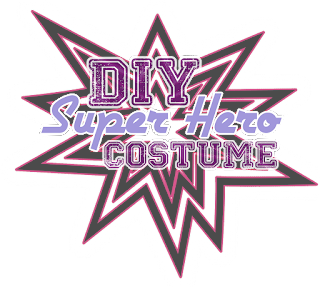 Once your iron-on is cooled down you can add the trim around the mask using a small amount of hot glue. (Tip) Start at the side where it will be covered up with a lighting bolt. Once your trim is on, you can hot glue the bolts on each side of the mask. And there you have it! I am absolutely in love with it and give myself a pat on the back because I am by far from a seamstress! I'm new to sewing and have so much to learn. Hopefully my mom will be able to teach me a thing or two, but for right now I will stick to easy stuff. :) Check back later this week for a link to round two voting! I can't wait to show you guys my project I am working on! I am totally obsessed with it. This turned out amazing, Sarah! Love it.